Mumbai: Jet Airways Ltd, the largest airline of the country, plans to sell and lease back aircraft it owns to raise up to $300 million over the next six months and cut its debt, a top official told Reuters on Tuesday. The airline, which has a near-quarter local market share, intends to sell and lease back part of the 40 planes that it owns, M. Shivkumar, senior vice-president - finance, told Reuters on Tuesday. “We have 40 aircraft on our own books. Depending upon the fund requirements, we will go accordingly," he said over the phone. Debt-laden Kingfisher Airlines, which cancelled scores of flights this month and is hunting for a strategic investor, also plans to raise funds through sale and lease back of some planes. On Monday, a source told Reuters that national carrier Air India too plans to sell and lease back Boeing 787 dreamliners to cut its debt. “We can raise up to $300 million. But it is not necessary we have to raise all of $300 million," Jet’s Shivkumar said. Jet’s fund raising plans comes amid comments by its auditors that raising money was essential if Jet’s accounts are to be prepared on a “going concern basis" in the future. Once a reflection of India’s growing economic prowess, the country’s airlines are struggling with surging oil prices, high sales tax on jet fuel and below-the-belt pricing due to increased competition, leading to massive losses. Analysts have said that irrational pricing by the likes of the national carrier Air India have made it impossible for airlines to raise domestic fares in the recent past. All three listed carriers Jet, Kingfisher Airlines and SpiceJet are currently loss making and state-run Air India is on government life support. In such a scenario, raising fares is essential to improve yields and margins for bleeding carriers, analysts have said. “Whenever there is a requirement to increase the fares because it is not in line with costs, fares should go up. Where is the choice?" Shivkumar said on Tuesday. Auditors to Jet’s smaller rival Kingfisher also had raised doubts about the airline’s viability if it fails to raise funds. Loss-making Jet, which has a total debt of about $2.7 billion, plans to retire about ₹ 1500 crore by the end of March, Shivkumar said. It also plans to use money from a land deal in central Mumbai to pare debt, Shivkumar said. Jet had signed a deal with Indian builder Godrej Properties to develop part of its land bank in Mumbai into an office complex. The airline has a fleet of 100 Airbus, Boeing and ATR aircraft, and plans to take 5-6 Boeing 737 planes on lease to expand operations, Shivkumar said. 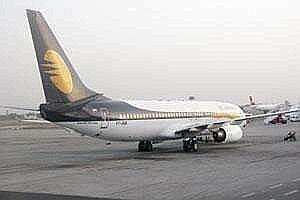 On Tuesday, Jet Airways shares, valued at $460 million, closed down 3.9% at ₹ 266.8 in a weak Mumbai market. The stock is down 64% so far this year, compared with a 21.9% fall in the benchmark index.